After quick research I found out that this error was introduced with some Microsoft updates and to resolve it on Windows Server 2016 14393.1884 you just need to apply another update 🙂 More specifically you need to install KB4053579, which can be downloaded from Windows Update Catalog. Applying this update resolves this error. 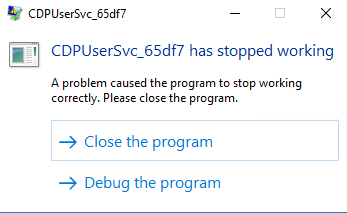 This entry was posted in Tech, Windows Server and tagged CDPUserSvc, Windows Server, Windows Server 2016 on January 25, 2019 by Mikhail. I’ve recently spent some time exploring Windows Nano Server installation option and wrote detailed blog post for StarWind blog entitled “Windows Server 2016 Nano Server – Just enough OS model” you can read it here. 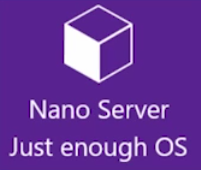 Article covers Nano Server basic concepts and compares this installation type with conventional Full Server and Server Core installation options – if you find this topic interesting please read on @ StarWinds Blog. This entry was posted in Tech, Windows Server and tagged Nano server, StarWind Blog, Windows Server, Windows Server 2016 on January 15, 2017 by Mikhail. All to often I see people doing wrong corrective action whenever they encounter “The trust relationship between this workstation and the primary domain failed” error, it seems that even some Microsoft documentation gives you bad advice. What you have to do if you got this error is use proper resolution methods instead of lengthy and wrong join workgroup, then join to domain again approach. Key thing to remember when you got this issue is never join workgroup and then to domain again as this process creates new SID and your machine will lose all its group memberships (if it had any, of course). Once done logoff your local user and logon back using domain credentials, problem solved! This entry was posted in How-to, Tech and tagged AD DS, Secure Channel, Windows Server on January 5, 2017 by Mikhail. How to: quickly check which installation type of Windows Server you are using? Another use case for this key is when you writing a script and need to adjust its behavior depending on whether it is being executed on Full Server, Core or Nano. This entry was posted in How-to, Tech and tagged Nano server, PowerShell, ServerLevels, Windows Server on January 3, 2017 by Mikhail. 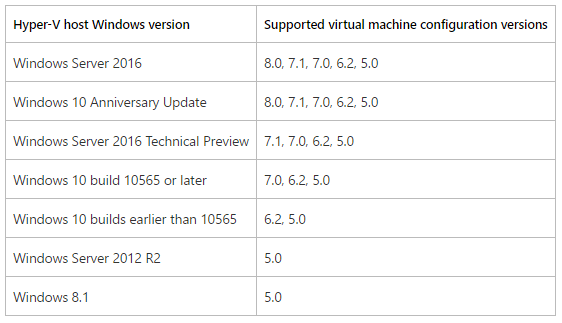 Windows 10 Hyper-V: What is “Upgrade Configuration Version…” option? To me option name is a bit confusing (which sometimes happens in MSFT products out of best intentions in attempts to simplify their wizards and wording). I was confused by this option name as it makes me think about configurations versioning and management rather about what it really means. To put it simply it is equivalent of what you can see in VMware Workstation as “Upgrade Virtual Hardware”/”VM hardware compatibility” (isn’t it more appropriate name? but I guess there is also differentiation needs which software vendors may have 🙂 ). 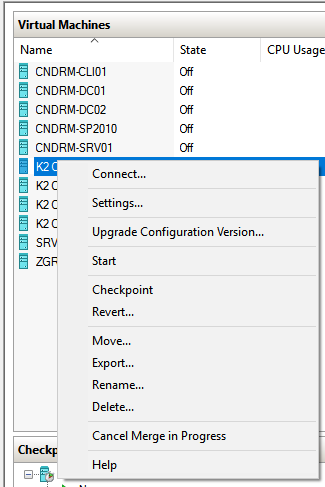 What you should know about this is in the past (prior to Windows 10) your VMs have been upgraded automatically to new configuration version, but now you have more control over this and have upgrade it manually via GUI (see screenshot above) or using Update-VMVersion cmdlet. This entry was posted in Hyper-V, Tech, Windows Server and tagged hyper-v, Windows 10, Windows Server on November 21, 2016 by Mikhail.